Bow saws are convenient tools for greenwood work as they are relatively cheap and blades are available with "raker" teeth to cut wet wood. However, they suffer from a couple of limitations. Firstly, most metal frames do not tighten the blade sufficiently so the blade wanders and larger cuts are not straight. Secondly, metal saws are quite awkward to carry as they don't fit easily into a backpack. 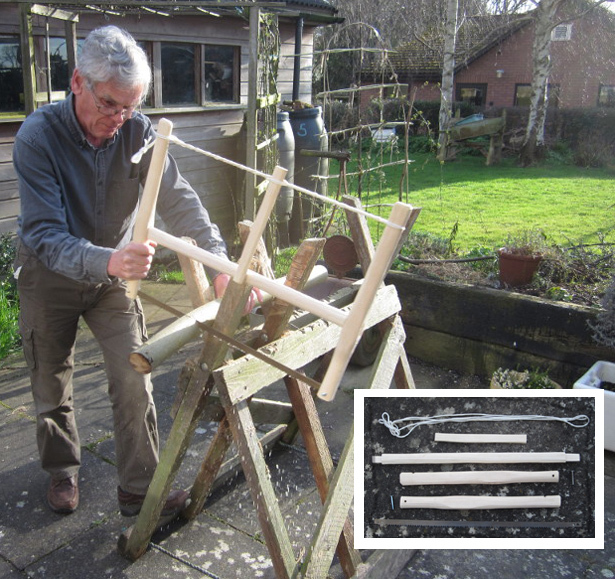 On this course you will learn to make a simple frame saw from cleft ash. These are effective saws which are nice to use and easy to transport. Jim demonstrates the use of his home made bow saw. Inset - the components.